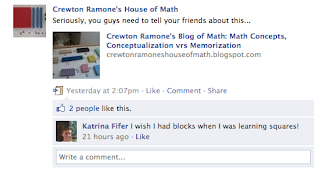 Crewton Ramone's Blog of Math: Time To Get Negative. 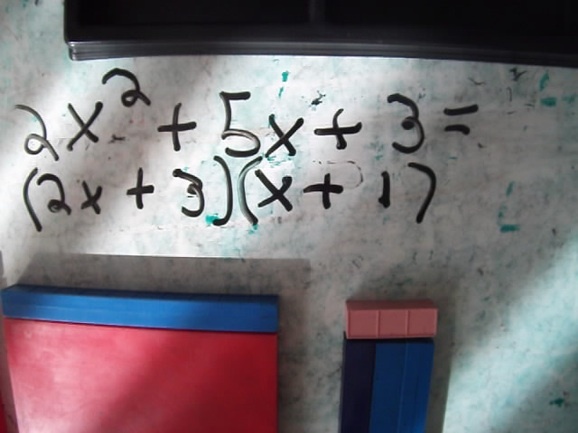 2x2 + 5x + 3, sure, but what about negative coefficients? and some people start with a presumption, "That's great but I bet you can't show negatives very well." Well enough to get this autistic kid to get it. Or "...that's great but what about trig?" What you have here is a uniform methodology for the visualization of mathematics...not just the positive part not just the rectangles. Eventually there will be the derivation of πr2 up on the sample lessons page, that 1/2 hour alone will be worth the price of admission. There are quite a few vids that I am told are worth the three bcks all by themselves. I am also told by marketers that the "problem" is the price is so low that people think there's no values there. I mean really, what can you get for 3 bucks? Hours and hours of instruction that's what. Plus PDFs. Did I mention the PDFs? I raised it from $1, apparently $19.95 is the going rate. MONTHLY. When I start getting some editing and some other paint and polish I will be raising the rates, meantime take advantage of the ridiculously low prices, NOW. It won't be long, this blog is already 3 years old, if you look at the first posts there were barely even pictures...lol...seems like yesterday. Anyhow, here is Philip getting ready to go negative. Note how he is less than enthusiastic, because he has had bad experiences with integers due to that thing called the number line. I have lots of great stories about children who were taught about integers with this methodology compared to the way they did in school. One where the younger brother started solving problems faster than his older sister who "had learned all about negative numbers in school" but the method she had been taught was confusing and laborious...after seeing what her brother had been taught by me she said what most people say upon learning math this way: "I wish I'd had the blocks when I was learning this..."
I see so many people who want to do too much too fast. "Okay, since they got that lets do this..." Remember degree of difficulty. Also the other thing to remember is you don't want to use the blocks for every single problem. The point is exactly the opposite...where you don't need the blocks once you understand the symbols anymore than you need pictures in your novels...but they were REQUIRED when you were first learning to read. When you get to the Sample Lessons Page just look for the tittle "Show me the negatives." There are plenty more example on the password protected screencasts page too...going all the way up to 3rd and 4th power algebra. BTW: I'd appreciate if a couple of people who do have passwords would comment on their experience with the password protected pages. Is it worth the 3 bucks or 12 bucks or what? If not here than on the facebook page and I'll screenshot it an paste it here. Just read your blog where you ask for feedback about the password protected pages. I have downloaded all your You Tube videos which are so helpful. Is there not some way that you can make it possible for us to download those screencasts? Anyway, thanks again for all the stuff that you’ve posted in various places already. I really is great! Labels: Advanced Algebra, Algebra, base 10 blocks, Base 10 Manipulatives, Integers, Math Enrichment, Mortensen Math.